Oman Airports (OA) have signed a contract with UK based CrowdVision and local partner, Ingenuity Technologies LLC to deploy a Passenger Flow Management system, to optimise the passenger experience and airport performance across the new Muscat International and Salalah flagship airports, covering all key airport areas. The CrowdVision deployment is already underway and once live, will measure passenger activity, passenger service delivery and asset utilisation 24/7. This enables complete airport optimisation through better planning, operations and continuous improvement. Passenger Experience enhancement by minimising waiting and creating opportunities to enjoy themselves, eat, shop and relax. Providing the capability to handle ‘off-plan’ days effectively in real time. Dr. Moaman Albusaidy, Chief Information Officer, Oman Airports said that “Oman Airports is committed to providing passengers with a smooth and comfortable journey. Oman Airports’ deployment of CrowdVision pursues to provide operational insight, both on the day and as part of a ‘plan do review’ cycle. It will support improvement in service, efficiency, and capacity optimisation. CrowdVision has been selected as a tool that provides a flexible and scalable solution and can be deployed in a collaborative approach “. Ingenuity Technologies and CrowdVision together are proud to be a part of this era of excellence in Oman. Recently recognized globally as the ultimate hallmark of industry excellence, Muscat International Airport has won the prestigious title of the World’s Leading New Airport in 2018 during the 25th edition of the World Travel Awards hosted in Lisbon, Portugal. Oman Airports is a government-owned company, responsible for the management and operations of the civil airports in the Sultanate of Oman. The infrastructure of the airports such as the terminal buildings, cargo building, runway, apron, car parking and other facilities are directly under Oman Airports management. Crowd Vision Ltd is a provider of live, accurate and actionable passenger data and insights. 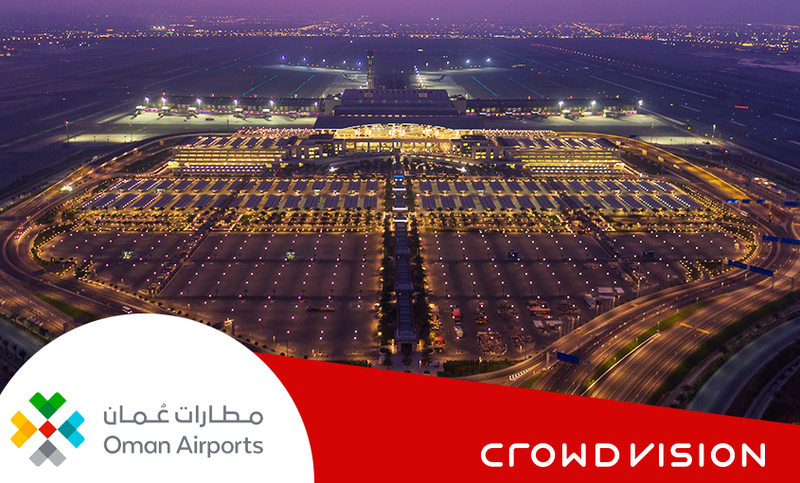 CrowdVision software measures what is happening to an entire passenger population in real time and over time. This enables our customers, including airports and airlines, to plan better and act decisively to improve passenger experience and increase efficiency and profitability. The CrowdVision solution processes live video input from commercially available IP cameras and detects pedestrian movements automatically using sophisticated computer vision and artificial intelligence techniques. CrowdVision delivers live data about everything from flows, queues and wait times to processing times, occupancies, and asset utilization. Live dashboards reveal actionable insights to improve real-time operations, whilst accumulated historical data provides reliable evidence for planning and investment decisions. Crowd Vision Ltd is headquartered in London, with offices in Europe (London and Belfast), the US (Austin and New York) and AsiaPac (Melbourne). Ingenuity Technologies is a leading fast-growing Omani organization furnishing innovative Information Technology and Capacity Building Solutions. Ingenuity seeded its headquarters back in 2002 by a small team of entrepreneurs in the Sultanate of Oman with 600K Omani Riyals as paid capital. Today Ingenuity incubates more than 150 talented professionals across its regional and global offices. Ingenuity is part of Bahwan CyberTeK (INGENUITY) Group. INGENUITY is one of the largest most credible software solutions provider and managed businesses. With footprint in Gulf, Middle East, USA, North Africa and South Asia, the group’s current annualized turnover exceeds USD 200 Million with more than 2000 associates.